As I've already said, I'm spending quite a lot of time in Haiku R1A2 these days in an effort to get more familiar with it. Although I've used earlier versions of it on and off over the last number of years, the lack of a usable browser made me avoid using other than for curiosity. But now with WebPositive, Haiku has suddenly become highly usable although there's still quite a way to go before it reaches the level of OS X or Ubuntu or Windows 7. Anyway, I'm going to post here some recent experiences, good and bad that I've had. Came across two really great apps for Haiku that are well worth getting to know. First there Synthetic Package Manager Pro which is a Haiku equivalent of Ubuntu's Synaptic Package Manager. This provides a very easy, and up to now at least, foolproof way to get Haiku apps installed. There seems to be only the Pro version available now and it's classed as shareware. When you try to use it, you'll be reminded that you need to register the app before it becomes viable. I sent €1 and the developer emailed me my very own version of SMPPro. This really takes Haiku out of the dark ages. One of the apps I installed with SMP Pro was GreenTube which goes quite someway to overcoming haiku's lack of flash. GreenTube let's you enter a YouTube url which it will next download and then play. Very useful. Incidentally, I had a lot of problems getting GreenTube to work (actually, it didn't at all work -- see comments in Haikuware) when downloaded from HaikuWare. But the version I got from SMP pro worked fine. 2. Mystery of very low free disk space. 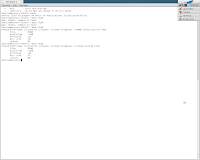 I had installed Haiku R1A2 on a 10.7 GB partition on a Dell Dimension E520. Over the years I've never seen the disk space occupied by Haiku exceeding more than 1 GB. So, I was surprised when I ran the Haiku app called FreeSpace (which I installed from SMP Pro) and found that almost 7GB were now occupied. DiskUsage showed me that /boot/common/var/swap was taking up more than 6GB. This forum thread explains everything and allowed me to get things back to normal simply by disabling Virtual Memory in Preferences and then deleting the /boot/common/var/swap file. Interestingly, immediately after this delete. FreeSpace still showed almost 7GB was being used although DiskUsage showed a very different graphic and showed the /boot directory to occupy less than 900MB even though the text on the graphic suggested that still almost 7GB was occupied. Typing df in terminal also said nearly 7GB was being used. After about 30 minutes when I checked again, everything now showed less than 1 GB of diskspace was being occupied. 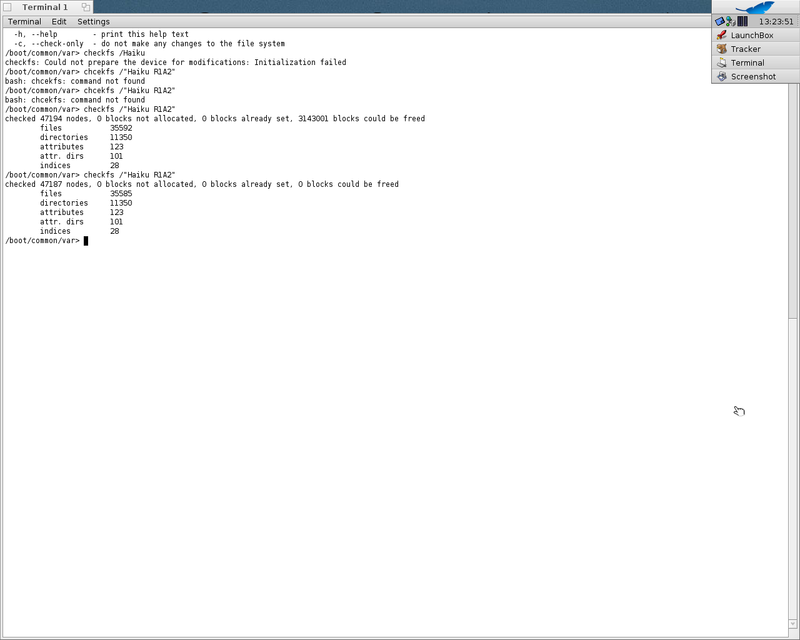 The screenshot shows the terminal output of the df command just after the deletion of the swap file and after about 30 minutes. I really have no idea why the various utilities took such a long time to update themselves. python -c "import SimpleHTTPServer; SimpleHTTPServer.test();"
in a terminal in Haiku and then fired up a browser (Chromium) on my MacBook and entered 192.168.1.1:8000 (the IP of the Dell E520 followed by port number 8000). After just a little delay, all of Haiku's directories become available on the MacBook. I've posted about this great command before but didn't know till know till now that it worked in Haiku. I've posted to the Haiku forum about the fact that I cannot send Gmails directly in Haiku although I can from the Haiku email client. More details are in the thread. The message I get in Gmail when the send fails seems to be quite common but no solution or explanation seems available. Up to now, nobody has replied to my forum post which generally means that either nobody has had this experience or that there's no obvious solution. Let's see. Almost immediately after I deleted the swap file as detailed in 2. above, I lost my internet connection to Haiku. However, Windows 7 which I have on the same box still had a connection. In Haiku, I could ping to the other computers on my network, and from them to Haiku, but I couldn't ping to the outside world. I considered replacing the network driver as I was very short of any other explanation. However, I left it for a couple of hours and when I came back to Haiku, the internet connection had reappeared. I really don't mind strange occurences as long as there is even a partial explanation. But this one is a mystery.